There are 3 monuments in Shanballymore, 1 structure and 2 Sweathouses. 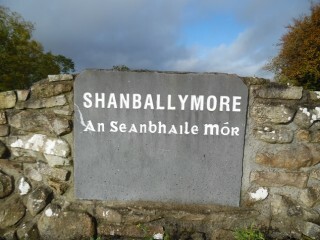 The National Monument Archaeological Service states that the structure is in pastureland on south facing slope on western extremity of Slieve Dart. The 3rd edition of Ordinance Survey 6-inch map (1930) shows a cluster of circular and rectangular structures which it labelled ‘Clacan’: a possible house cluster. (b) at the east edge of the cluster, 170m to east of the above structure, a small open circle at the head of a stream is labelled ‘Sweating Kilns (in Ruins)’. Due to land clearance in the area, no visible surface trace of any of these features survives. The ‘kilns’ may be the same as those noted by Neary (1914, 126) ‘on north side of the mountain road at Quinultagh’ but shown on his location map circa 2.2km to west-north-west of the above, not located by the survey.